A pair of standard US Dog Tags with custom texts of your choice! Included with the tags is a long and a short ball chain (no idea if these have nickel or not) and the rubber silencers. Please note: Before ordering dog tags, read and comprehend the instructions completely and thoroughly. Especially the part where available characters are listed. If after all this you have questions, don't hesitate to ask. Better safe than sorry. 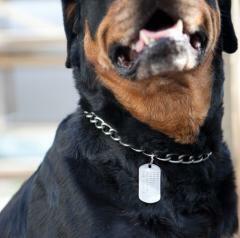 The dog tags are identification tags worn by military personnel. This current two dog tag system was introduced back in 1916 and is still in use today. 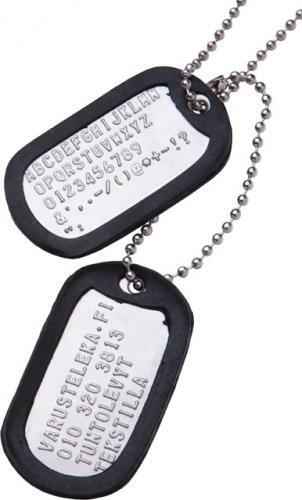 Most other companies that offer dog tags with custom texts cut corners by either offering these inscribed or painted. We decided to do things properly with a dog tag press. The text is stamped on the tags and will last a lifetime (if not lost). A single dog tag has five rows with 15 characters fitting on each. 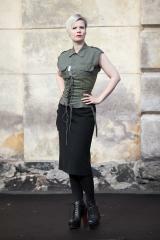 Available characters: ABCDEFGHIJKLMNOPQRSTUVWXYZ 1234567890 &',.-/()@*+~!?" and of course space. All characters, including space and dots, abide to the character limit - if you put 14 spaces on one row, you can put one letter. 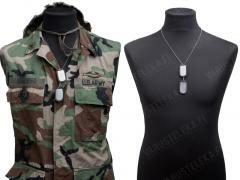 The dog tag set includes two dog tags, one long and one short ball chain. Typically these have identical texts, but can be pressed with any text, as long as the customer plays with the character rules. Custom work - no refunds. The customer is solely responsible for the text - spelling mistakes made by the customer are his/her responsibility and will not be refunded. Of course, if WE make a mistake (which exceedingly rare but not unheard of), well, that's a whole different story. M. at the end the first name stands for the initial of the middle name. Serial number can also be read as SOCIAL SECURITY number. Religions are e.g. PROTESTANT, ORTHODOX, CATHOLIC and so on. These do work as actual dog identification tags too - they are strong and the info on them won't wear off ever! IMPORTANT! As mentioned, our dog tag press can only do the listed characters. If a text contains characters that are not on the list, they will be removed or replaced without notice. (This is how it's done in the military...) So, DO NOT order any characters not listed above. If only one dog tag text is given, this will be pressed on both dog tags. 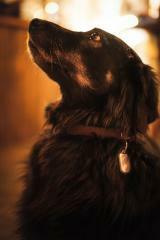 All personal information on the dog tag is treated with strict confidentiality (i.e. 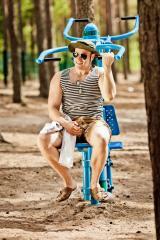 not for marketing or any other dubious purposes) and can be removed from our systems on request. Kuten moni on maininnut, niin näiden ketju on melko heppoista tekoa. Muita ratkaisuja tietysti on esim. nahkanauha, kengännauha, kettinki tai avaimen lenkki (sellanen pyöree kierre johon on tosi kurja ujuttaa mitään, kyllä te tiedätte). Näillä virityksillä saa pysymään. Hienothan nää on, teksti on helposti luettavaa, ja sitä mahtuu aika paljon. Lisäksi se ei kulu pois ihan heti, todnäk. ikinä. Nää on kevyet, eikä kilise kun pistää silikonit reunoihin - ne tosin saattaa haparoitua ajan ja sään armoilla. Näillä on helppo nimikoida tavaraa, tai voi vaikka antaa lahjaksi kaveripiirille, kun painattaa näihin inside-läppiä. Ei huonot! Rather long delivery time. The printing on the dog tag was made opposite way as shown at picture = text was harder to read. The rubber protection/sound silencers start to dissolve and get sticky after a few weeks of active use. Refund of item was an easy process. Still, I will order a new pack as I need them. Painetusta tekstistä rivi 1 jää lähes kokonaan kumin alle, joten ei ole luettavissa. Itselläni ei alimmalla rivillä ollut tekstiä, mutta pelkään pahoin, että sen kanssa kävisi samoin. Tuoteselosteen yhteyteen olisi hyvä lisätä tarkempi ohje tekstin asettelusta ja näkymisestä. The tags came out pretty good. Stamping on the 7's were a bit shallow but still visible. The rubber sleeves I got were very roughly cut, still had sizable rubber bits hanging off them. Fairly good overall. Would still order more should the need arise.